Started up a bonus model for the month. Bit of an Adams family vibe off him right now. 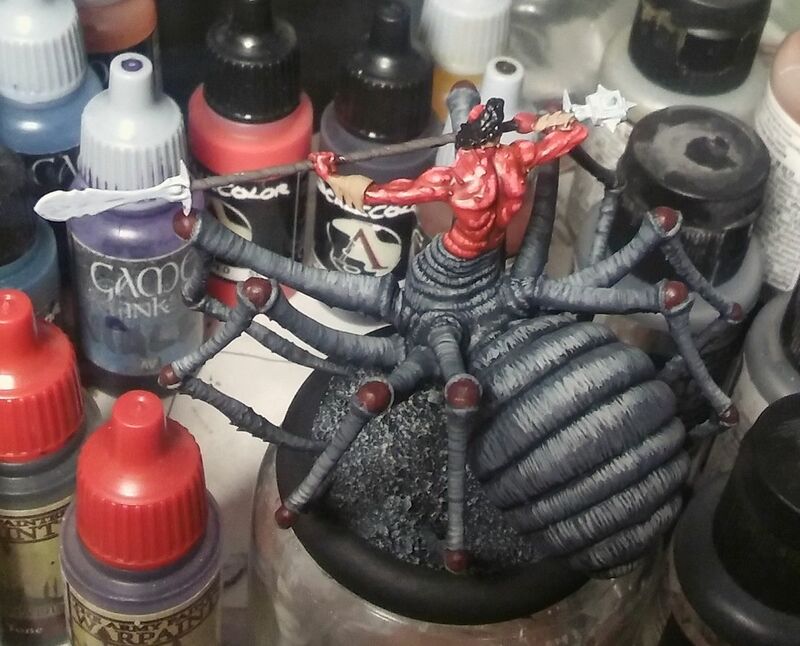 Didn't take pics, but last night I started doing some work on Jorogumo after long time neglecting it. Those legs get in the way of everything! It's a friggin merry-go-round. Left hand of the flesh construct as Thing!!! @Athiko I've seen one in the past. Couldn't find it here with a quick forum search. I think I've seen it here. Facebook too, if you're in A Wyrd Place. Worth a search, bloody well painted that was. Progress! 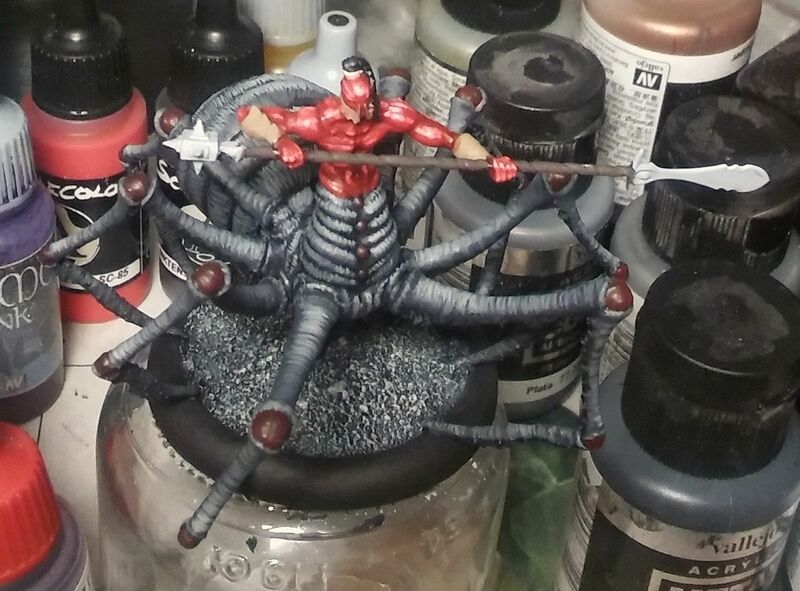 Finished the grey spider bit. Non-grey details on the spider bit still utter WIP of course. And everything else. But still, good progress done mostly today. Need to check some tutorials and reference material before I can keep working rest of the mini. Utter Side Topic / Trivia: The Addams Family home in the original Black and White series, was painted mainly in shades of pink. Apparently that's an easy shade to control relative light / dark values. My Silurid is done for 7 SS in March. I may come back and gloss coat it later to give a more slimy feel, not sure. That is the same model, but it has a really different feel from this angle. In other painting news, I just this week I discovered necron compound---I wish I had known about this stuff before. My House Escher and Brotherhood of Steel models are really forging ahead quickly now. Queeg came together surprisingly quickly. Puts me at 22 stones for the month I believe. 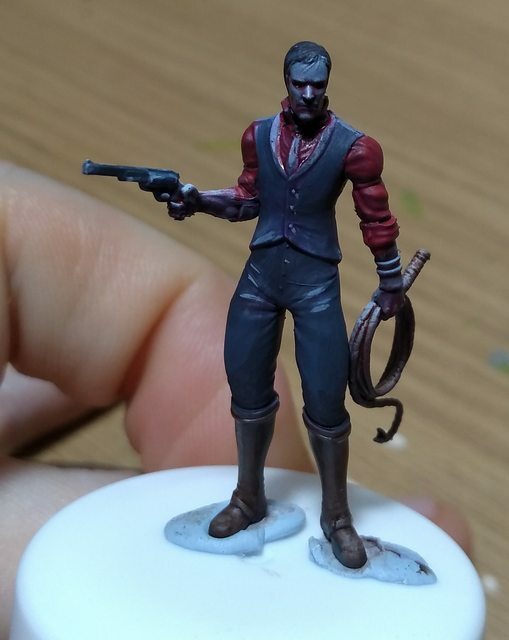 What do people usually do for hair on the Malifaux plastics? The detail is so shallow I'm finding edge highlighting impractical and the threads are too fine to line or wash effectively. Eyes... I do them if I do them. No trick. Just a sharp #3 and a bit of flow aid. And do them first! Easier that way I find, you can be a bit messy painting them. Just paint neatly around the eyes afterwards. For hair I like to draw very fine lines to imitate sculpted hair texture. So, I managed to complete my vulture (posted earlier), and my Acolytes, as promised. They're not my best, and not my worst. The snow effect is a bit meh, but the cloaks are very pleasing indeed. 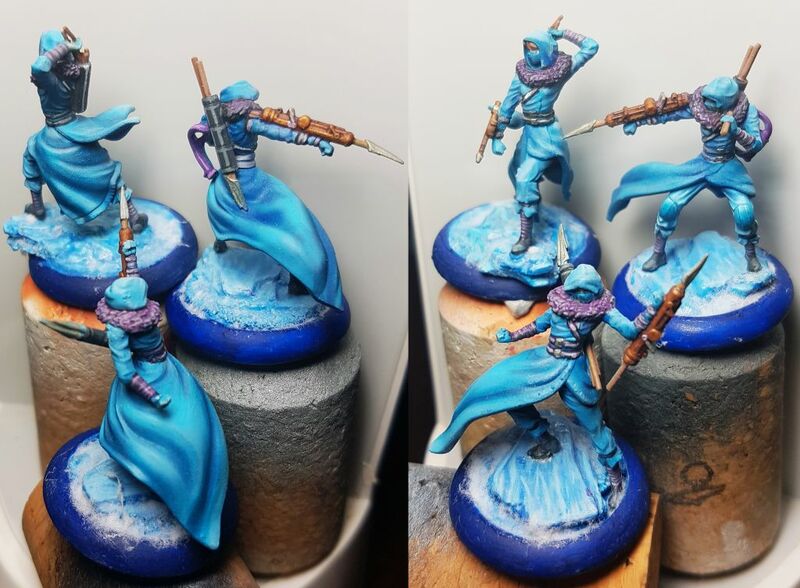 So, 24SS painted this month. Remember, everyone, March is crunch time! If you've Mulliganed twice, then March is the month where you have to start! Hopefully I'll manage to finish him by the end of the month. 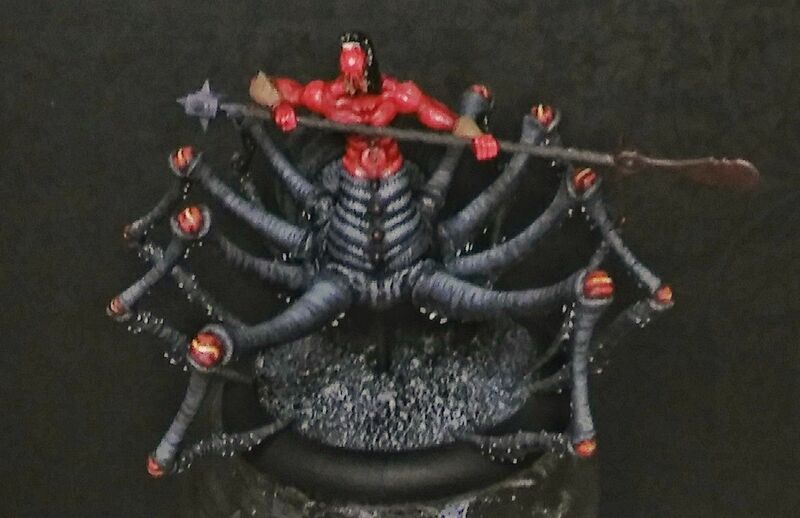 @Caedrus the smooth transitions on the acolytes are pretty nice. I remember when you started working on one last year I believe, when you started using an airbrush. Are these transitions on the cloth done 100% with an airbrush? Or did you use a normal brush as well? At the risk of OT: Is anyone from the challenge going to be at Adepticon this weekend? I'll be there Saturday to check out the dealers' room so I thought it'd be fun to hook up for a refreshing beverage if any of my fellow painters will be around. @Franchute Any chance we could get another picture of Mouse? This one's a bit out of focus so it's hard to see the detail. 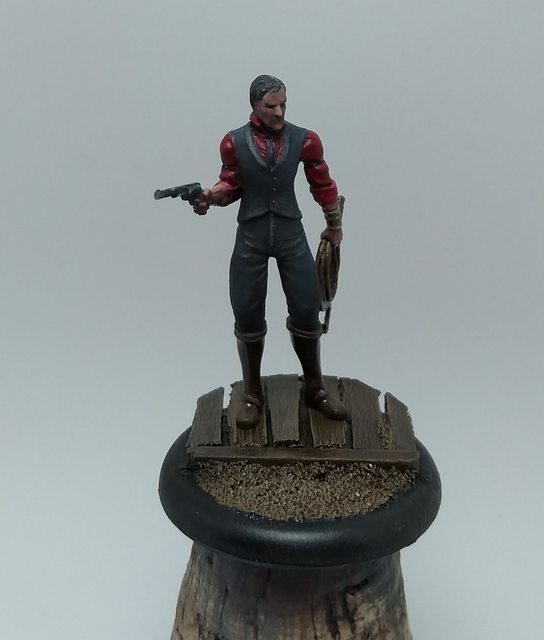 Ryle's brushwork is really solid. 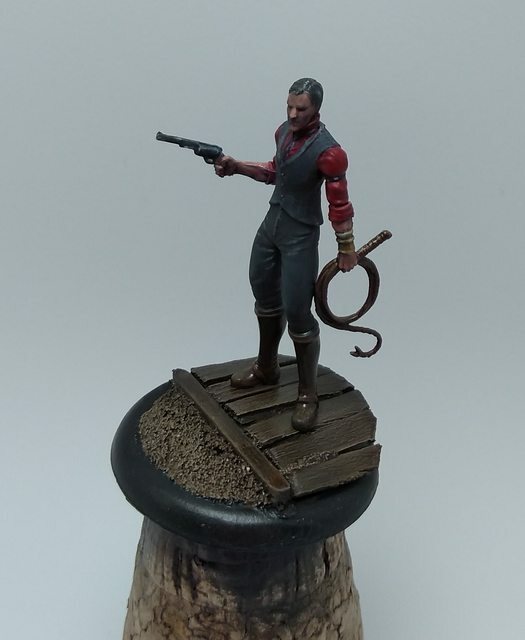 I like the texture and color you've achieved for his base as well - how'd you do it? I see water effects and tufts and maybe sand in there? @Nikodemus That's some disturbing texture - I like the fact that you've gone the tarantula/wolf spider route and not the shiny, smooth carapace as sculpted. Nice gap filling on the abdomen too, that must've been a pain. @Caedrus Love the cloaks. +1 to Franchute's question about airbrush vs. normal brush. For Ryle base, it is a simple recipe. 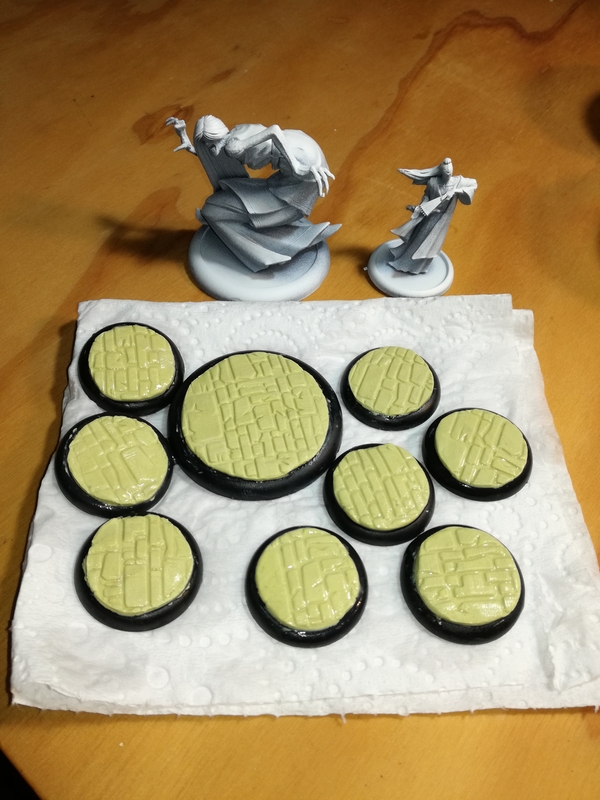 I first painted the base in a dark green (GW Caliban green in particular). Then I pasted some tufts and sand here and there. 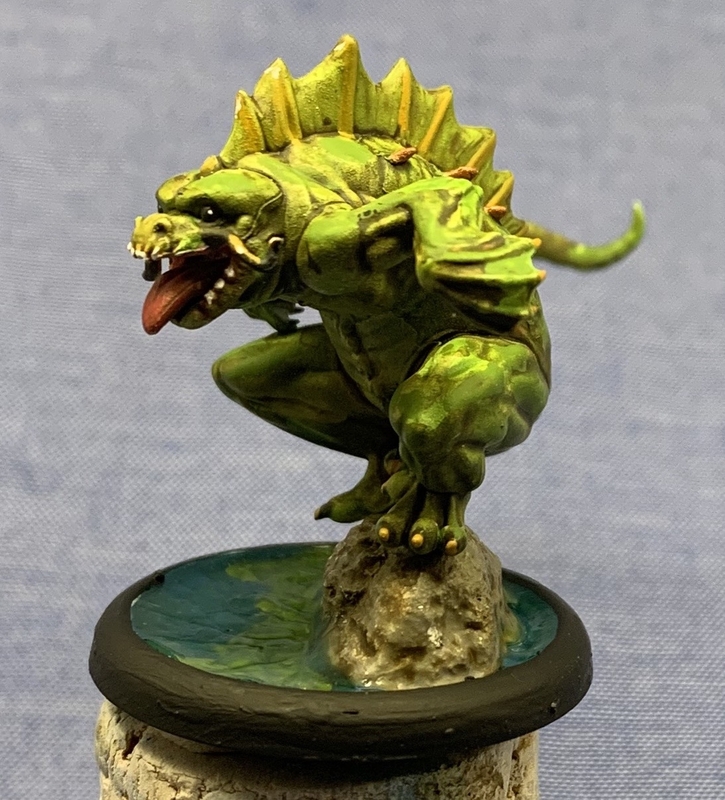 Then I used @Viruk's mixture of GW Nurgle's Rot and Vallejo Still water. I may have put two or three coats (you have to wait each coat to dry before applying the next one, i.e. it is a simple recipe but it is not quick). Each coat has in proportion more still water than the previous one. Finally I put a pure coat of still water. Hi guys, I haven't been very vocal this month as beta testing and organizing an escalation league to bring new players has eaten up most of my time. (And being in constant pain has eaten much of my mental energy.) 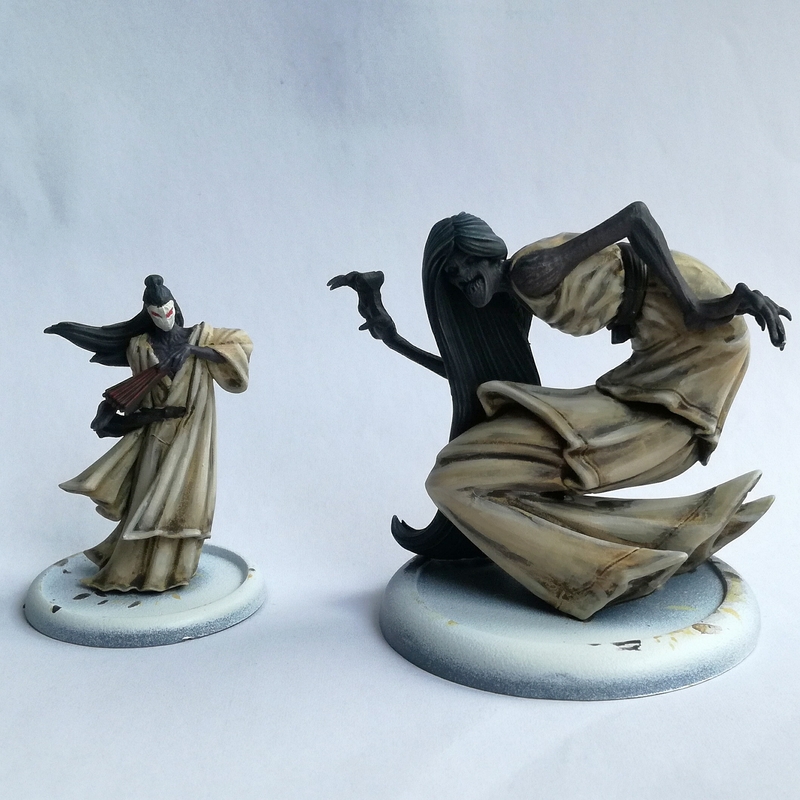 This has also made me change my pledge to Ikiryo and an Onryo (as that's what I've been painting for the league). They're not done but I think I'll manage before the end of the month. I apologize for not offering up any opinions or specific praise at this moment but I just don't have the mental fortitude at the moment. I'm really impressed with everyone's progress though, it's very inspirational and motivating! @emiba Ikiryo and Onryo look very promising. I'm looking forward to seeing more. I hope everything is good for you in Christchurch and things are not as ugly as the news suggest. Between an earthquake and the recent stuff, it doesn't sound like any city! I´m fine but was locked in at work for a few hours while things were unfolding. Not sure what they're showing abroad, but yeah, New Zealand is pretty small, someone figured out that someone shooting 50 people is the same percentage as someone shooting 3344 people in the US. People from all walks off life are rallying to show support though and for the most part, (apart from the act of terror itself and a few other ugly displays of intolerance) the aftermath has been a display of hope. Nice work @emiba, hoping things pick up for you soon. Edit: Aaaand l just realized that Ikyrio is 0 points in M2E... FML. 😝 Maybe I'll have time to paint up a Seishin..﻿. IIRC we decided to let folks pick their edition w/r/t points. I'm using 3e costs for my pledges. Glad you're (mostly) OK amidst the troubles - hope things improve for you quickly. Painted "lava" effects on the joints of Joro's feet. Felt they needed some pizzazz. And with that, the spider parts are almost done. Just a few "belly gems" to do. 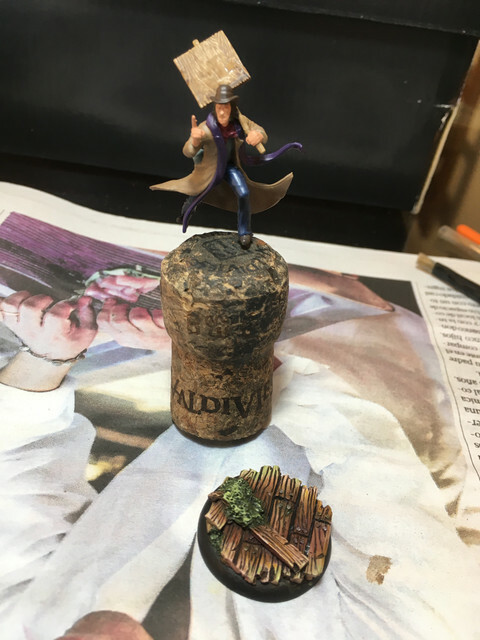 @Franchute and @misterfinn: For the Acolyte cloaks, I started with airbrushing. 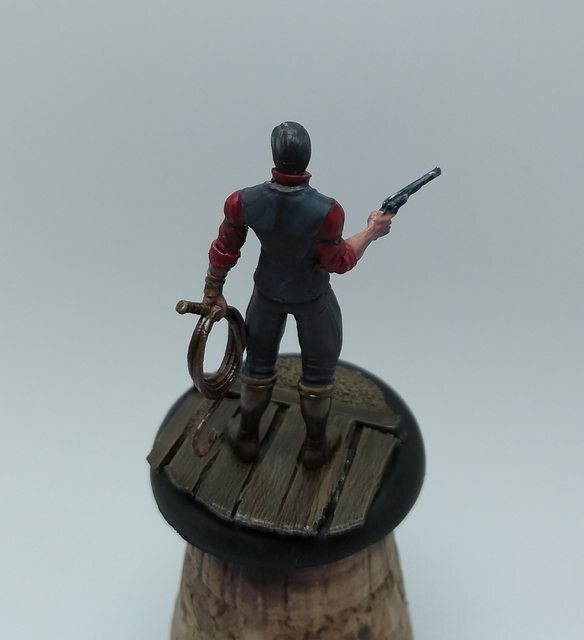 Because I don't yet have the control of the airbrush that I'd like, I tend to do a lot if my airbrushing by doing light sprays, tangentially across the surface of the figure. This helps protect the deeper creases. My highlights are not yet quite as fine as I'd like. More practice required. I then try glazing colour transition areas, to smooth them out, or to get a touch more recess contrast. If you haven't tried an airbrush, you really should. It's not a universal tool, but with surprisingly little practice, you can get really pleasing results. If you haven't watched the YouTube painting videos by "Buypainted", I found them helpful.